Unfortunately, Jackie’s story isn’t unique. As America’s population rapidly ages, so too do LGBT adults. 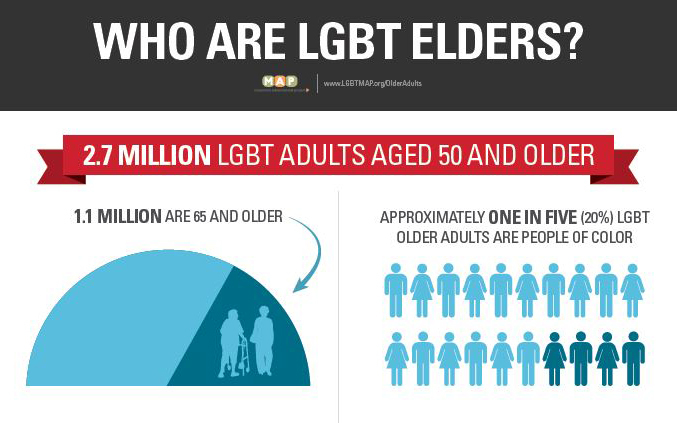 Currently, there are more than 2.7 million LGBT adults aged 50 or older–nearly one third of all LGBT adults. What makes aging different for LGBT adults than other adults? Understanding Issues Facing LGBT Older Adults, a new report from the Movement Advancement Project (MAP) and SAGE, looks at this question and sheds light on the unique needs and experiences of LGBT older adults. Many LGBT elders have survived and thrived despite a lifetime of obstacles and discrimination, while others struggle with the burdens of poverty and social isolation. The report finds that health and wellbeing, economic security, and social connections are among the cornerstones for successful aging, yet these are areas in which many LGBT elders face substantial barriers—stemming from current discrimination as well as the accumulation of a lifetime of legal and structural discrimination and social stigma. The cumulative impact of discrimination over a lifetime leaves LGBT older adults at increased risk for poverty. First, systemic discrimination, especially in housing and employment, and a long-term lack of legal and social recognition combine to create deep economic insecurity for LGBT elders. Jackie, for example, was bullied and harassed at school, her grades suffered, and she was unable to obtain a scholarship to attend college. She started work at a factory, but was fired when her boss saw her and Frances together. Nearly one-third of LGBT older adults ages 65 and older live at or below 200% of the federal poverty level, compared to a quarter of non-LGBT older adults. 47% of bisexual older men and 48% of bisexual women live at or below 200% of the federal poverty level. And transgender older adults have similar rates to bisexual older adults. One study found that 48% of transgender older adults live at or below 200% of the federal poverty level. Second, historical lack of legal recognition, necessitated reliance on chosen family, and lack of funding for LGBT-specific aging resources mean that LGBT elders are susceptible to isolation. Jackie was not permitted to create a legal relationship with Frances, or Frances’ son, meaning that Jackie had no one who could make medical or financial decisions for her, despite relying on them for care as she aged. It’s not surprising then, that LGBT elders are much more likely to live alone than non-LGBT elders. Furthermore, despite being less likely to have family to care for them, a fear of discrimination means LGBT older adults are also less likely to access necessary services from external providers such as visiting nurses or meal programs. Finally, this pervasive discrimination, combined with a lack of competent, inclusive health care, leads to increased mental and physical health disparities. LGB older adults have significantly higher rates of psychological distress than heterosexual older adults, and transgender older adults have even higher levels. Advocates and researchers suggest that access to services is made more difficult by mental health conditions. Living alone, like many LGBT elders do due to lack of family connections, increases social isolation and loneliness, significant predictors of depression among older adults. These factors may be further compounded by family rejection during their youth and a historical lack of services for LGBT people. These experiences are linked to depression among LGBT adults. All older adults have a right to dignity and support as they age, including LGBT elders like Jackie. This report is a resource for LGBT older adults and their advocates—an illustration of the disparities and a clear roadmap for change. Click here to read the report. Editor’s note: this is a guest post by one of our partner organizations.